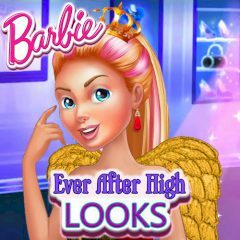 Ever After High is a cool cartoon and Barbie is a big fan of it. Help her to copy the look of one of her favourite characters. Put on makeup, dress up and appear beautiful in front of the mirror. What would you do, if you had a favourite character? Many girls follow their celebrities and favourite persons, but they lack of courage to look like them. Barbie isn't afraid of this, so when she had the opportunity to makeover her look, she didn't doubt about it. Pick one of Ever After High characters and copy the look!